By attacking Libya, without Congressional approval, Obama violated his constitutional power and thereby committed an impeachable offense. Libya does not pose an actual or imminent threat to the U.S.
No More Bombing People to Save Them! Bring the Endless War Dollars Home! Take Back the Nobel Peace Prize! Kulani: New cannon fodder reporting for duty…. Press Release: Is Fukushima about to blow? The media has a responsibility to explain the possible worst case scenario at Fukushima. Authorities in Japan and the U.S. appear to be downplaying the seriousness of the crisis in an attempt to protect the nuclear industry rather than protecting people and the environment. For more comments by Burnett see malu-aina.org. 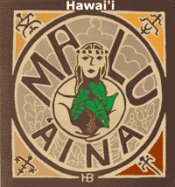 See additional important articles on the malu-aina.org website about Fukushima and the article below. March 28, 2011 “Information Clearing House” — – Conditions at the Fukushima Daiichi nuclear plant are deteriorating and the doomsday scenario is beginning to unfold. On Sunday, Tokyo Electric Power Co. (TEPCO) officials reported that the levels of radiation leaking into seawater at the Unit 2 reactor were 100,000 times above normal, and the airborne radiation measured 4-times higher than government limits. As a result, emergency workers were evacuated from the plant and rushed to safe location. The prospect of a full-core meltdown or an environmental catastrophe of incalculable magnitude now looms larger than ever. The crisis is getting worse. “A senior nuclear executive who insisted on anonymity but has broad contacts in Japan said that there was a long vertical crack running down the side of the reactor vessel itself. The crack runs down below the water level in the reactor and has been leaking fluids and gases, he said…. The media has switched into full “BP Oil Spill-mode”, making every effort to minimize the disaster and to soothe the public with half-truths and disinformation. The goal is to conceal the scale of the catastrophe and protect the nuclear industry. It’s another case of profits over people. Still, the truth is available for those who are willing to sift through the lies. Radiation has turned up in the Tokyo water supply, imports of milk, vegetable and fruit from four prefectures in the vicinity of Fukushima have been banned, and the evacuation zone around the plant has widened to an 18 mile radius. “Administration spokespeople continuously claim “no threat” from the radiation reaching the US from Japan, just as they did with oil hemorrhaging into the Gulf. Perhaps we should all whistle “Don’t worry, be happy” in unison. A thorough review of the science, however, begs a second opinion. Twice as high as Chernobyl already, and the disaster is likely to persist for months to come. Things are getting worse, much worse. The Japanese government has been downplaying the crisis to make it look like they have matters under control, but it’s all a sham. They control nothing. The rescue mission has been a flop from the get-go and now things are at a boiling point. The emergency effort has been overtaken by events and now it’s a matter of “wait and see”. We’re approaching zero hour. The Japanese government is trying to protect the powerful nuclear lobby. The same is true of Obama, who continues to promote nuclear energy even while radiation belches from battered Fukushima. He’s not thinking about the public; he’s thinking about the deep pocket constituents who fill his campaign coffers. Japanese workers are putting their lives on the line to regain control of the broken facility, but with little success. The probability of another fire, another monstrous explosion, or a full-core meltdown increases by the day. The Fukushima fiasco is gaining pace putting tens of thousands of people at risk of thyroid cancer, childhood leukemia and other life-threatening ailments. As I mentioned, Fukushima does not correlate to Chernobyl. If I had to place odds, I would have bet that the technicians could not have put the reactor into such an unstable condition without all sorts of bells, whistles and automatic safety equipment stopping them. Even then, if the huge voltage spike had not come down the line, or if it has occurred ten seconds later, Chernobyl could not have happened. Fukushima was waiting to happen because of the placement of the emergency generators. If they had not all failed at once by being inundated by a tsunami, Fukushima would not have happened as it did – although it WOULD still have been a nuclear disaster. The problem is that you don’t want to play with this stuff. A nuclear reactor means bring fissile material to a point at which it is hot enough to boil water (in a light-water reactor) and not not enough to melt and go supercritical (China syndrome or a Chernobyl incident). You simply cannot let it get away from you because if it does, you can’t stop it. If reactor 3 is in meltdown, and I believe it is, the concrete under the containment looks like lava. But Fukushima is not far off the water table. When that molten mass of self-sustaining nuclear material gets to the water table it won’t simply cool down. It will explode – not a nuclear explosion, but probably enough to involve the rest of the reactors and fuel rods at the facility. You asked me the solution. Well, it is a self-sustaining reaction. Nothing can stop it except stopping the reaction. And that would require a nuclear weapon. In fact, it would require one in each containment to merely stop what is going on now. But it will be messy. Those idiots have had a level 7 nuclear disaster going for almost a week but won’t admit it. It is going to dwarf Chenobyl- the disaster is occurring the opposite way than Chernobyl, which exploded and stopped the reaction. At Fukushima, the reactions are getting worse. I suspect three nuclear piles in meltdown and we will probably get some of it. I am one of the few non-government radiological first-responders in the state and my equipment is ~1 order of magnitude more sensitive than what is issued to the fire department. I’ll get it and recalibrate it tomorrow or Monday and provide instant information. I can measure Alpha, Beta and Gamma, not just Gamma – so I can provide a much clearer picture of what we are seeing. Pouring concrete on a critical reactor makes no sense – it will simply explode and release more radioactive particulate matter the concrete will melt and the problem will get worse. Chernobyl was different – a critical reactor exploded and stopped the reaction. At Fukushima, the reactor cores are still melting down. The ONLY way to stop that is to detonate a ~10 kiloton Fission device inside each reactor containment and hope to vaporize the cores. That’s probably a bad solution. Anyway, here is the information that the US doesn’t seem to want released.